This is a fun, cute and interesting game for bridal shower. This is also a door prize game. 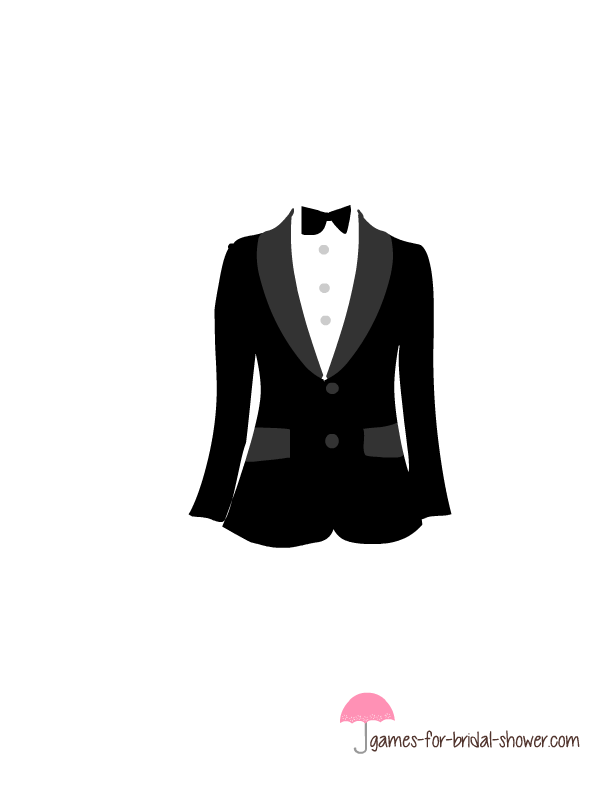 In order to prepare for this game, first take print outs of the tuxedo image given below according to the number of your bridal shower party guests. Then cut heads from pictures of different celebraties from magazines. Paste those heads above the tuxedo and in one page, paste the head of the groom. Fold the paper and put these in envelopes. How to Play: Shuffle and distribute, who got the groom game's envelopes among your bridal shower party guests. Ask them to open the enevelopes and the person who has gotten the tux with the groom's head will be the winner. This is a free printable Tuxedo image for Who Got the Groom Game. Just click on this image and a bigger image will open up. Right click and save that to your computer. You can print this image using even black and white printer. .